In this review, I test the new full-frame Pentax K-1 Mark II while shooting astrophotography and landscapes in Alabama Hills, California. 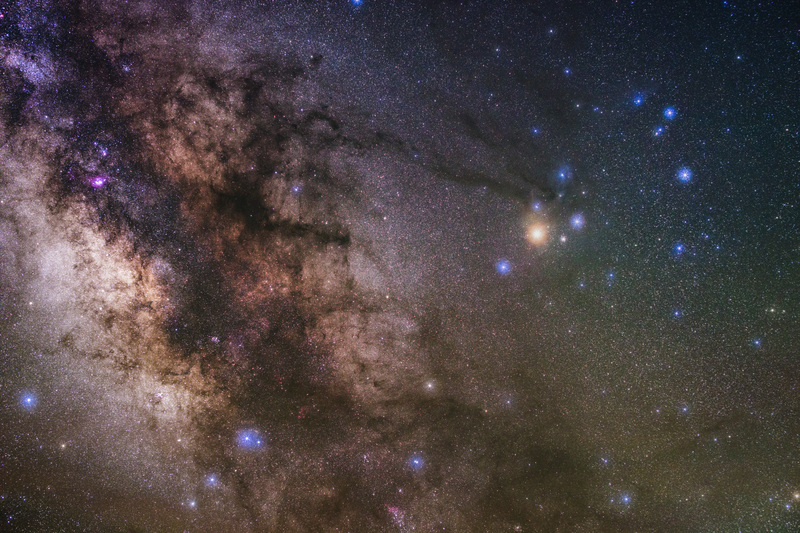 The K-1 Mark II features Pentax’s exciting Astrotracer feature for astrophotographers and a Pixel Shift Resolution feature, both features intriguing for landscape and astrophotography. 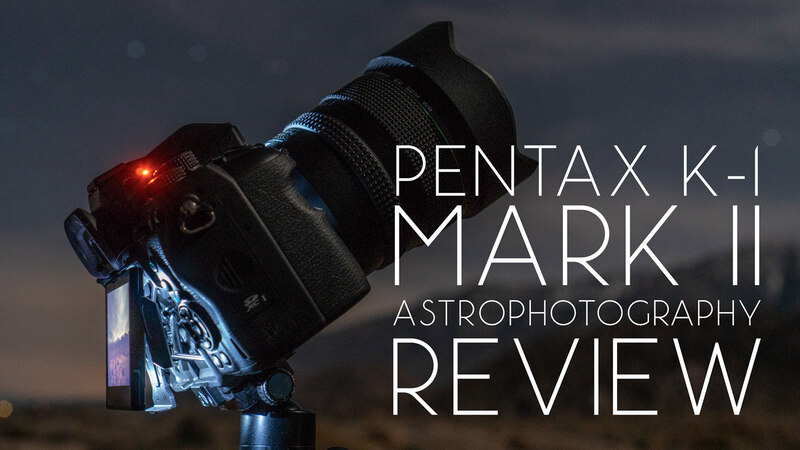 The Pentax K-1 Mark II has numerous features geared specifically towards astrophotographers and that makes it one of cameras that we’ve been most excited to test. 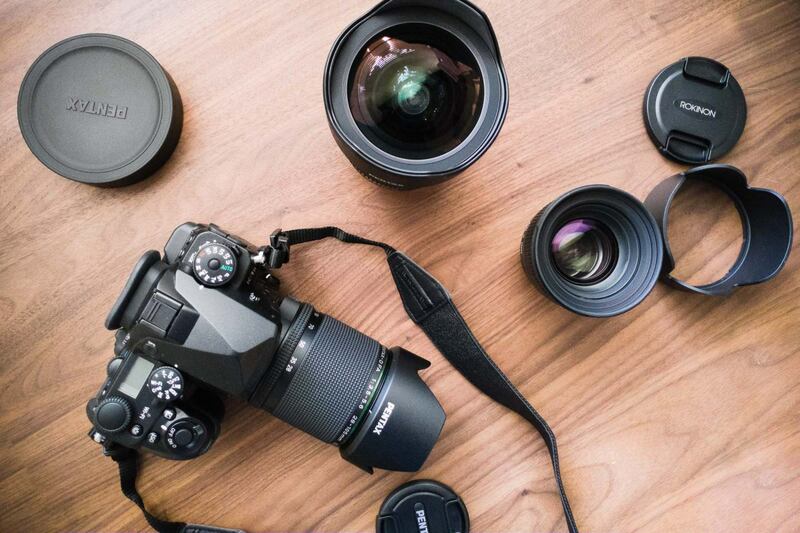 Pentax is sort of an underdog in the digital photography world. They entered the digital full-frame market with the original K-1 DSLR and this new Mark II version is very much a incremental update of that camera. The Mark II version adds an extended high ISO range up to 819200, and a handheld Pixel Shift Resolution mode. What originally intrigued me about the K-1 Mark II is its overall feature set and specifications for the price. It’s available at release for just under $2000 USD and has one of the most complete and impressive feature sets of any full-frame camera, at least on paper. The K-1 and K-1 Mark II’s 36 megapixel sensor is image stabilized with a 5-axis in-body shake reduction system, a unique feature for a full-frame DSLR . The Sony a99 II is the only DSLR (technically a DSLT) to offer the same feature in a full-size DSLR style camera body. Astrotracer is a unique feature to certain Pentax cameras. Using the K-1 Mark II’s built in GPS, compass and accelerometers, the camera automatically knows where it’s pointed relative to the night sky. When Astrotracer is enabled, the camera automatically shifts the sensor stabilization system to compensate for the Earth’s rotation. This capability allows the camera to track the stars for up to a 5 minute exposure. Depending on a few factors such as the focal length and camera composition, Astrotracer makes it possible to make extended exposures of the night sky with little to no star trailing for sharp, pinpoint stars. Astrotracer provides a similar benefit as mounting the camera to an equatorial tracking mount but without any of the extra weight or expense. If there’s one feature I was most excited about trying, it was definitely Astrotracer. Honestly, I’m not sure why I hadn’t tried it out sooner as Pentax has featured it in some of its other camera models (K-3, K-3 Mark II) for several years. 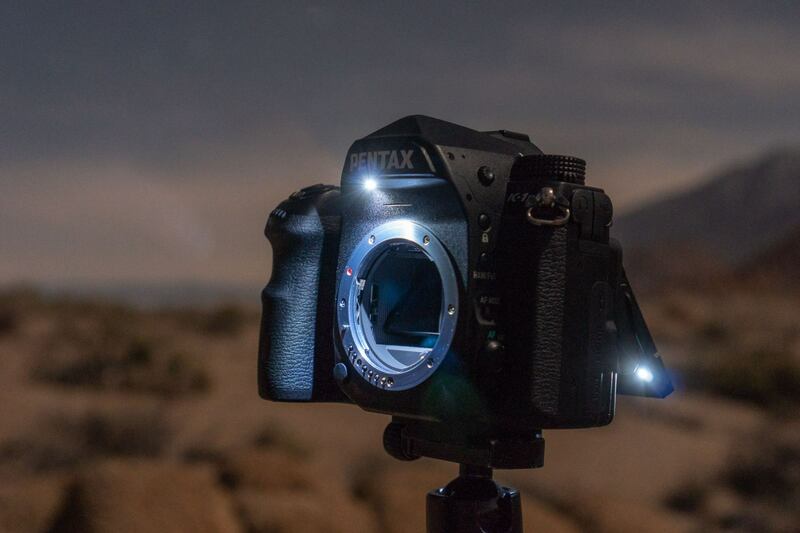 If it works like Pentax claims, it could provide a huge benefit to shooting the night sky. Also utilizing the camera’s built-in sensor stabilization mechanism, the K-1 Mark II’s Pixel Shift Resolution mode allows the camera to make higher resolution images that exceed the capability of a typical RGB “Bayer” style imaging sensor. By shifting the sensor one pixel between each of a series of 4 photographs, the K-1 Mark II can record red, green and blue color data for every pixel location. Pentax has included Pixel Shift on their original K-1 and their flagship APS-C cameras for several generations. New to the K-1 Mark II, Pentax has added a handheld mode for the Pixel Shift Resolution feature that allows the photographer to shoot Pixel Shift images without a tripod. The resulting Pixel Shift images have increased detail, better color resolution and reduced noise levels. In some studio tests, the K-1 Mark II’s Pixel Shift resolution mode can even out-resolve a single shot from a 50 megapixel medium format camera. The only other full-frame camera from another brand with a similar Pixel Shift capability is the new Sony a7RIII. We’re particularly excited to test the K-1 Mark II’s Pixel Shift Resolution mode at night with long exposures for bringing out more detail in the foreground of a landscape astrophoto. The K-1 Mark II has several sets of small LED lights that can illuminate various parts of the camera body at the press of a button for use in dark conditions. There’s a small light to illuminate the lens mount and several more on the back side of the rear LCD screen to illuminate the rear buttons when the screen is pulled out away from the camera body. 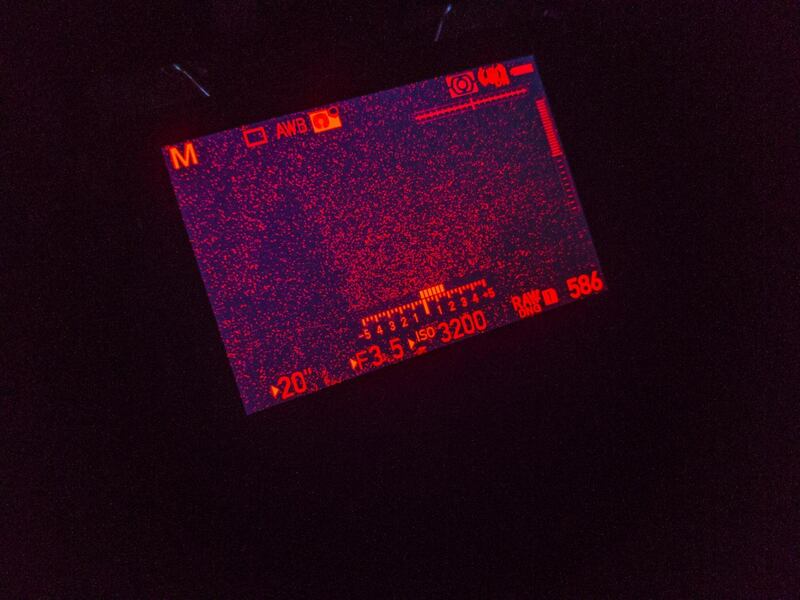 The K-1 Mark II also features a red “night vision” mode for use in dark conditions that turns the LCD entirely monochrome red in order to help preserve the photographer’s night vision. In practice, we found the red night vision mode to be not very helpful. The live-view feed is not bright enough in dark conditions to allow for easy framing when the red mode is enabled. During image review, the mode was slightly more useful but we actually preferred just setting the LCD monitor to normal mode and reducing the brightness all the way. That allowed for color image review without being so bright that our night vision was completely ruined. 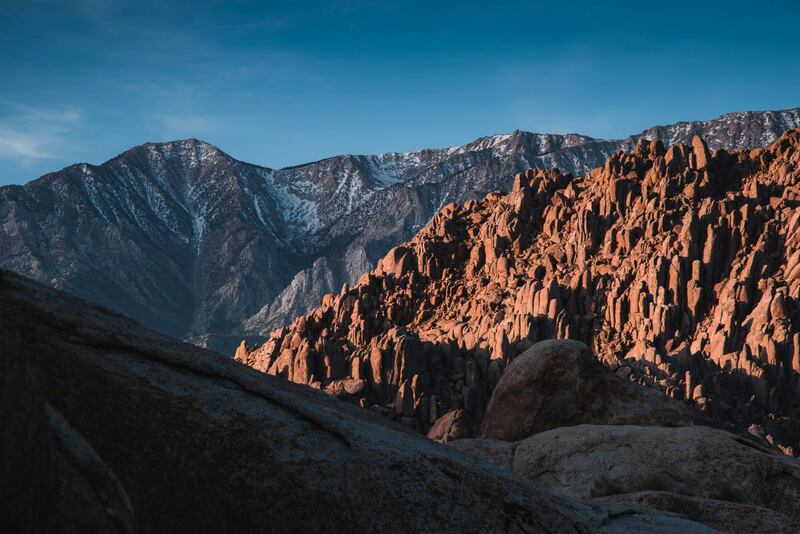 For this review, we took a road trip from Los Angeles, California to Alabama Hills near Lone Pine, California. 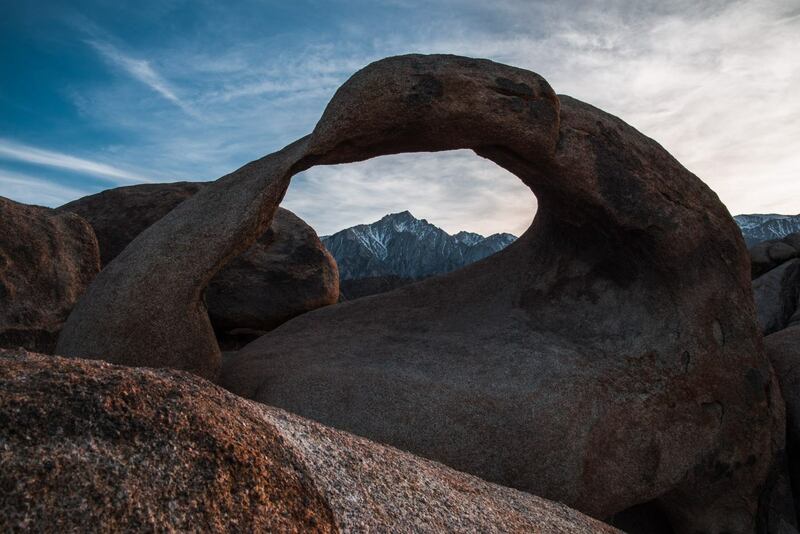 Alabama Hills is an all-time favorite spot for us at Lonely Speck. 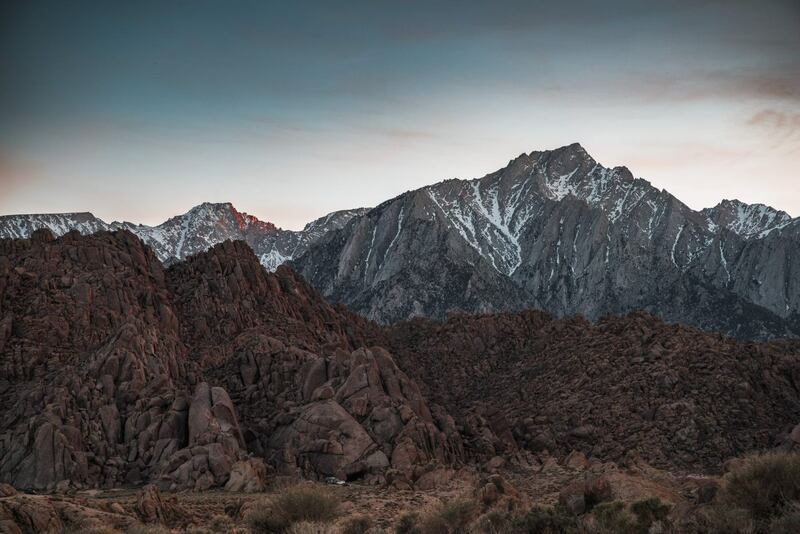 It has beautiful views of the Eastern Sierra mountain range, dark skies and free camping. It’s perfect for astrophotography. With the help of B&H, we kitted up the K-1 Mark II with the Pentax 28-105mm f/3.5-5.6, Pentax 15-30mm f/2.8, and Rokinon 50mm f/1.4. The K-1 Mark II is heavy. I’ve been shooting on Sony full-frame mirrorless cameras for the past 4 years and I still have the featherweight Sony a7S as my daily driver. 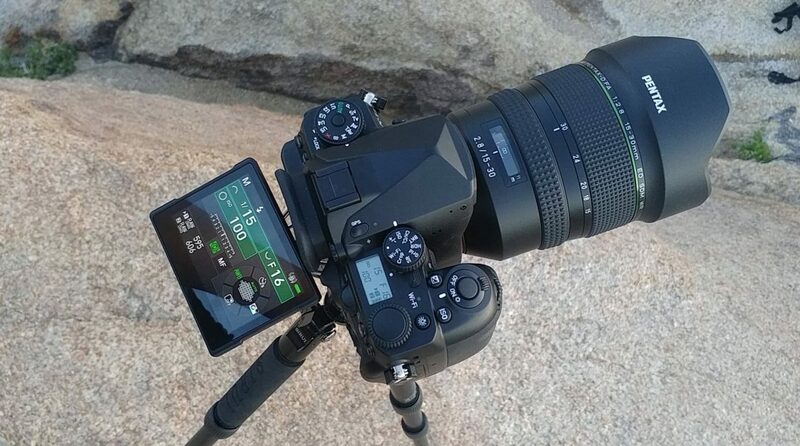 Coming from the diminutive a7S to the K-1 Mark II is kind of a shock. The K-1 Mark II features a nearly all metal alloy build and classic DSLR ergonomics. At 925 grams, the K-1 Mark II is not just heavy when compared to a mirrorless camera, it’s heavy for a DSLR. It’s heavier than the Canon 5D Mark IV (800 grams) and even the Nikon D850 (915 grams). Compared to my 4-year-old, 490 gram a7S, it’s nearly twice the weight and twice the size. That said, some people like the solid feel, large grip and rock solid build of a DSLR like the K-1 Mark II but I’d be lying if I said that I preferred lugging around a camera that was twice as big. But with the weight comes a benefit. 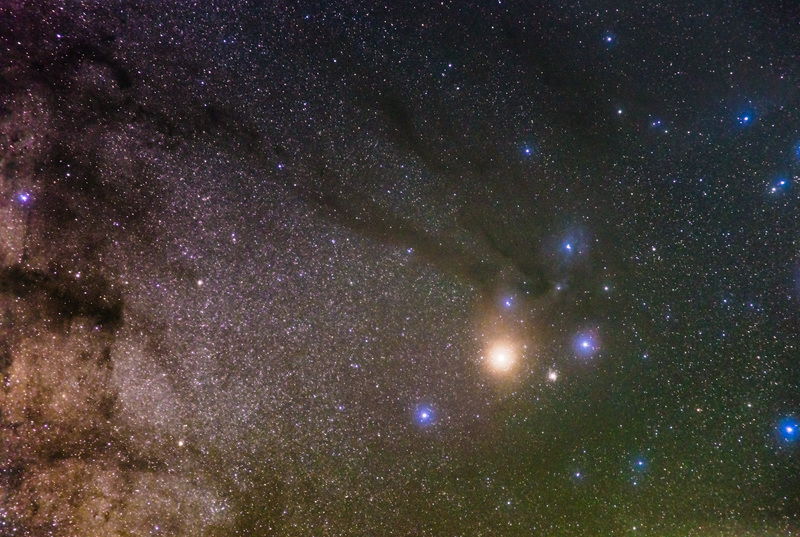 There are few camera manufacturers that have as good of a reputation when it comes to build quality and weather resistance as Pentax and there are still no full-frame cameras with as many unique astrophotographer-centric features as the K-1 and K-1 Mark II. Overall, in spite of the weight, the camera is comfortable to hold and very well built. I’d feel much more comfortable in harsh conditions with the Pentax K-1 Mark II than I would with my comparatively fragile feeling Sony a7S. 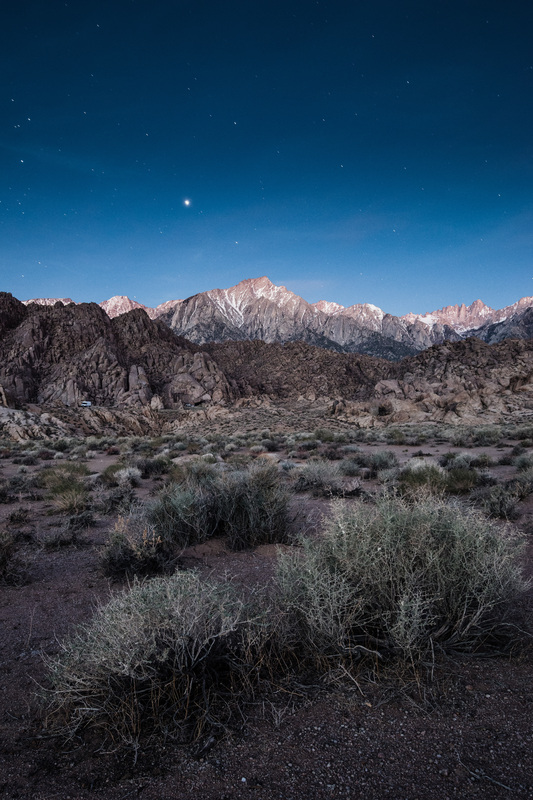 The most notable handling convenience for astrophotographers is the night body illumination. I did find that the body illumination LEDs were very nice and helpful for lens changes in the dark. The lens mount is adequately illuminated for lens changes when the illumination button is pressed. On its lowest brightness setting, I found the little white LEDs to be only mildly intrusive for astro shooting but it might be best to avoid if trying to fully preserve night vision or if you have other people shooting near you at night. They’re nice in a pinch and they’re less disruptive than using a headlamp. The K-1 Mark II features a control scheme that feels like a cross between a Canon and a Nikon, in a good way. It has Nikon-like front and rear dials for independently controlling aperture and shutter speed and a third control wheel on the top plate that can be used to change secondary exposure or camera functions like ISO, bracketing, continuous shooting speed and HDR. 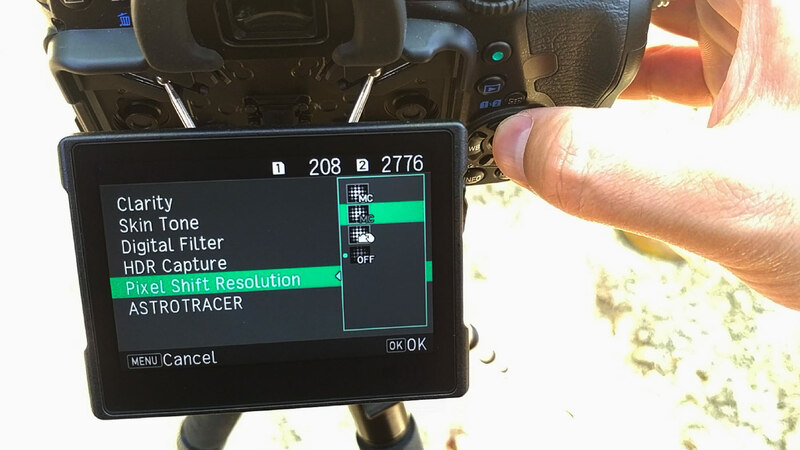 A small top LCD shows basic exposure settings and an array of buttons around the camera give direct access to most of the important functions of the camera. 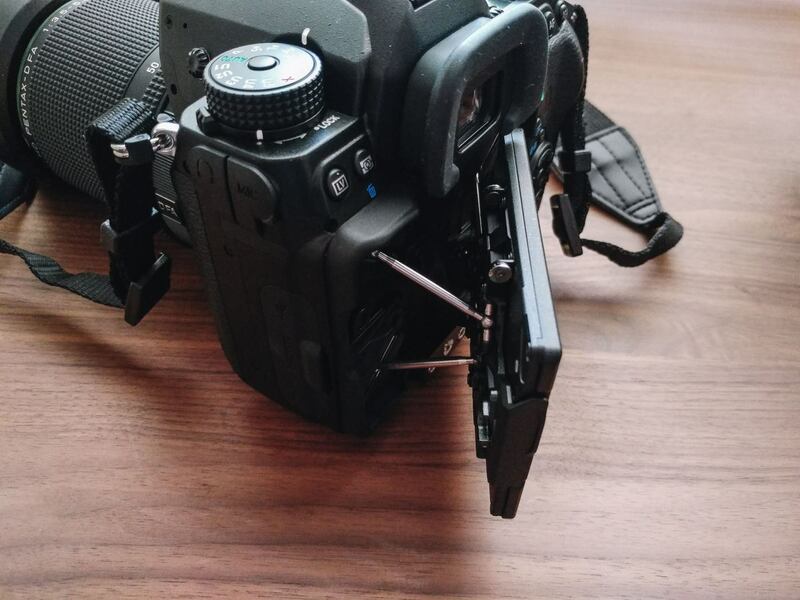 Pentax K-1 Mark II rear LCD tilts on a very unique mechanism that allows for 4 axes of movement. The main LCD screen tilts on 4 axes allowing it to flip in portrait or landscape orientation and rotate slightly. It’s a mechanism that’s unique to Pentax and I found it rather nifty and convenient. The K-1 II’s range of motion in the portrait orientation is not quite as useful as the tilt screen on a camera like the Fujifilm X-T2, which allow more tilt. Where the LCD falls short is in its low-light live-view feed: in very dark shooting conditions, it’s fairly noisy and dark which makes focusing and framing a little bit more challenging. It’s not as dark of an LCD feed as most Nikon bodies but it still falls short of most Canon or Sony cameras. 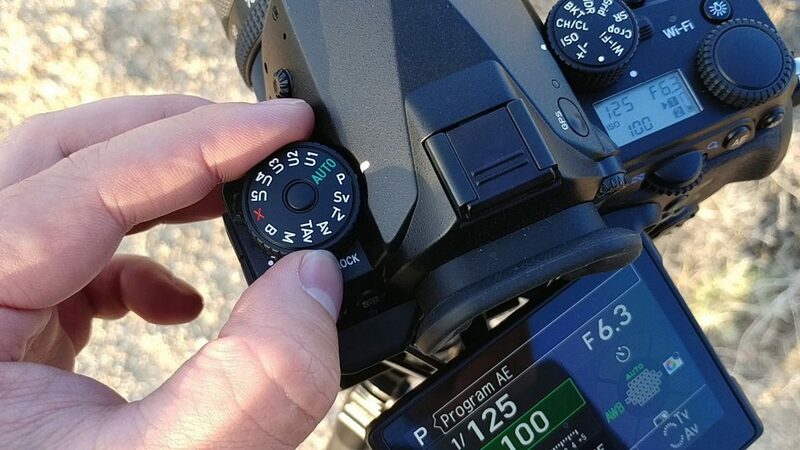 There are only two customizable buttons: An Fx1 button on the front left hand side of the camera and an Fx2 button which doubles as the “down” arrow of the 4-way control button on the rear of the camera. There are 5 separate user modes (U1, U2, U3, U4, U5) available on the control dial that allow the photographer to save any and all settings for a particular shooting condition. It’s also possible to re-name these modes with labels so that it’s obvious as to the function. For example, I pre-programmed an “Astrotracer” mode that automatically enters astrotracer mode and a “Pixel-Shift Long Exposure” mode that’s set specifically for long exposure pixel shift resolution shots. Pentax K-1 Mark II and 15-30mm f/2.8 with the rear LCD tilted out. Some final notes about shooting with the K-1: This isn’t a great video camera or sports shooter. It doesn’t shoot 4K, it’s 1080p video quality is only OK, it has no phase-detection AF in video mode, and it also has a max burst rate of only 4.4 frames per second in full-frame stills mode. This camera is clearly targeted more towards landscape and studio photography.. That’s not to say you can’t use for video or sports but there are better cameras available for those types of shooting. We also wish it offered USB charging for portable power while shooting and for topping up the battery while on the go, but it doesn’t. ISO-invariance testing is something I like to do on cameras in order to more fully understand their ISO performance and to gauge the best ISO settings for a camera in ultra-low light shooting conditions. To test the camera’s ISO behavior, a series of images are shot using the same exposure settings (shutter and aperture), but ISO is varied between each image from base ISO (100) up to high ISO (204800+). Then, in post processing, the images are equalized in brightness and compared. Read more about how to perform an ISO invariance test here. The K-1 Mark II is not quite as ISO-invariant as I expected, particularly after reading about the ISO-invariant behavior of the original K-1. At ISO 100, the K-1 Mark II shows tangible magenta shift and an increased amount of noise. Noise levels are improved by ISO 200 and there’s also a slight reduction in noise from 200 to 400 and 400 to 800. From there up, the camera appears very ISO invariant with no real tangible difference from ISO 800 all the way up to ISO 51200, above which dynamic range starts to take a hit and the bright centers of stars start to clip with the modest exposure settings I chose for this test. ISO 204800 has enough reduced dynamic range at this exposure setting to clip the highlights. ISOs higher than 204800 are probably not relevant for this test. The K-1 Mark II’s relatively ISO invariant behavior indicates that the sensor has excellent dynamic range. While it’s likely that ISO 100 offers the most total dynamic range for highlight detail, if I were expecting to need to greatly push shadow levels in post processing, I would step my ISO to at least ISO 200 for the best improvement in shadow noise. A previous version of this review made some hasty conclusions about how the K-1 Mark II’s noise performance affected stacked astrophotos. I’ve removed those changes and am investigating the issue further before deciding to change my original review, if at all. Overall noise performance on the K-1 Mark II is excellent. There is nearly no tangible sensor bloom or electronic glow in highly pushed images and noise levels are low. The Pentax K-1 II was criticized by DPReview for a strange behavior when it comes to high ISO noise performance. As demonstrated in our ISO invariance test, the K-1 Mark II seems to exhibit slightly less overall noise at ISOs above 400. That’s usually a good thing. However, at these higher ISOs, the noise profile appears slightly “muddier” or smoothed. While my astrophotography exposures at first glance seemed to be generally acceptable for low-light exposures, and I’m fairly happy with most of the images that I’ve made, it’s clear that Pentax is applying some kind of noise reduction to ISO settings above ISO 400. The bigger problem is that this noise reduction affects RAW files and cannot be disabled. While I don’t personally have the original K-1 with which to compare this K-1 Mark II, in DPReview’s full review of the K-1 Mark II, they showed that the original K-1 could resolve slightly more detail at ISOs above 400. It’s it a big difference? Not really. In practice, the difference is very small and I never felt disappointed with the K-1 Mark II’s capability to resolve detail at high ISOs. Most importantly, the problem is not detrimental to star details and does not present the same problem as the Sony star-eater issue. I do, however, agree with DPReview and I wish that manufacturers would stop trying to apply noise reducing techniques to RAW files. These operations are much better saved for JPEGs or for post processing when the photographer can make the choice of how much or how little noise reduction to apply. Some small noise issues aside, I was really excited to try out Pentax’s Astrotracer. It’s a feature that, in my opinion, is truly a game changer for astrophotography enthusiasts. With the feature enabled, I found it possible to shoot exposures about two to three times longer than I would usually attempt for an exposure of the night sky on a normal tripod. I found accuracy, even without calibration to be surprisingly good, better than I expected. Pentax K-1 Mark II Astrotracer Comparison – 15mm, 60s, ISO 3200. Full resolution. 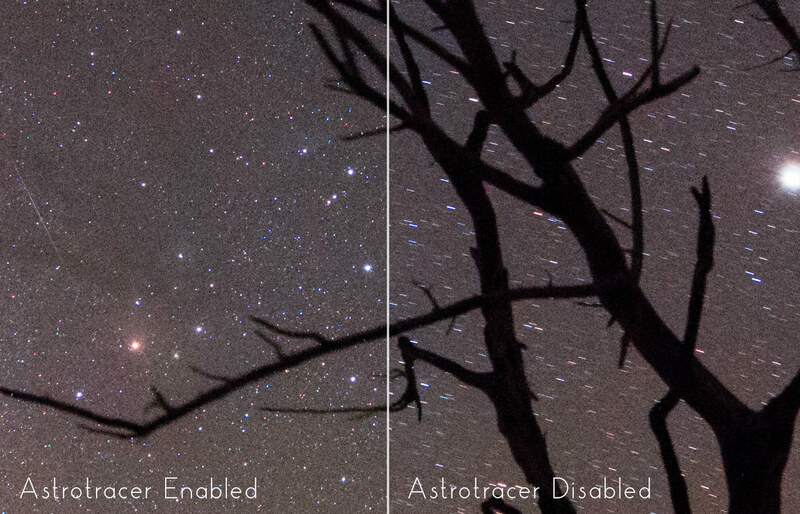 Pentax K-1 Mark II Astrotracer 100 percent crop comparison. 60s exposure. In my tests, Astrotracer seemed to work nearly flawlessly, at least within the realm of expected limits. There are some quirks to keep in mind, however. 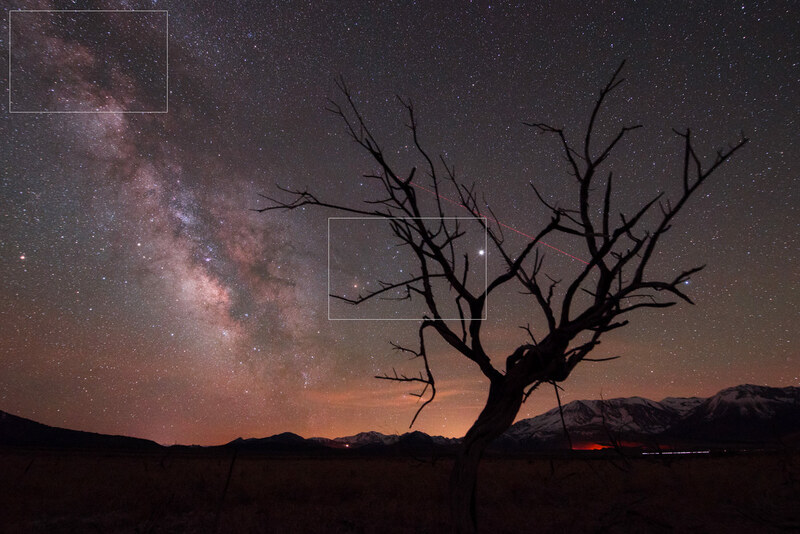 For landscape astrophotography, we still need to remember that Astrotracer tracks the stars only and as a result, an Astrotracer exposure will have a blurred foreground. That means that if shooting landscape astro shots, it’s necessary to shoot one Astrotracer image and one non-Astrotracer image and combine them in post-processing with a mask. For simple compositions, masking two shots together like this should be trivial, but it can be a significant challenge when working with complex foreground/background masks such as those created by tree branches. 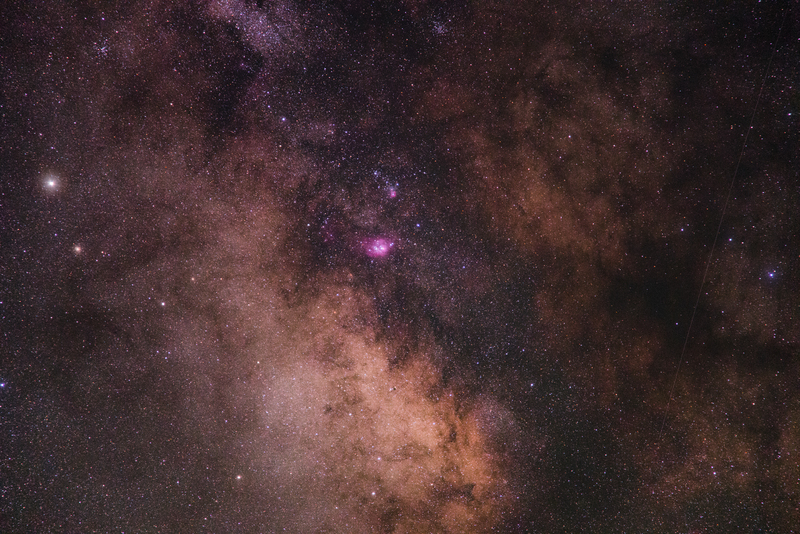 Milky Way Galactic Center, Pentax K-1 Mark II, Astrotracer, 40s, 50mm @ f/4, ISO 6400, Stack of 9. Full resolution. Where Astrotracer really shines is in making pure night-sky shots, with longer focal lengths and no foreground. 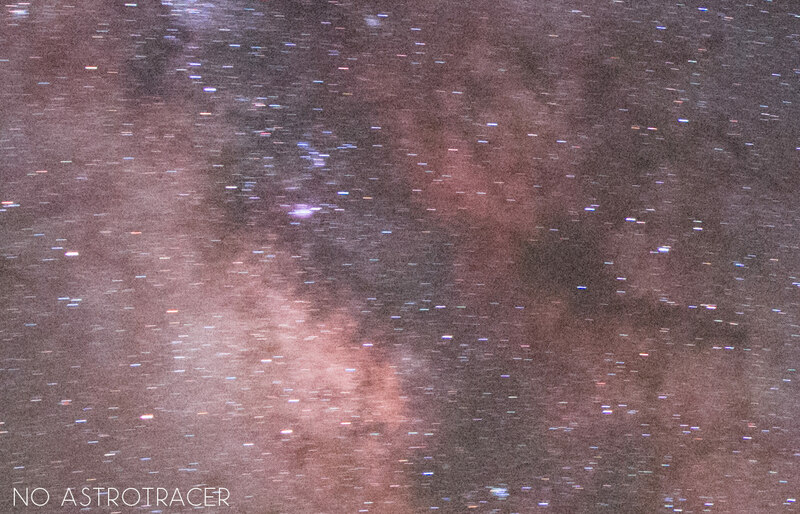 With Astrotracer enabled, I was able to very easily shoot tracked shots of closer details of the galactic center with the kit lens zoomed all the way to 105mm, something that would be much more difficult (or require a lot more post-processing) on any other camera without Astrotracer. Even at f/5.6 when zoomed in to 105mm, the slow kit lens made some very nice exposures of the night sky when used with Astrotracer. 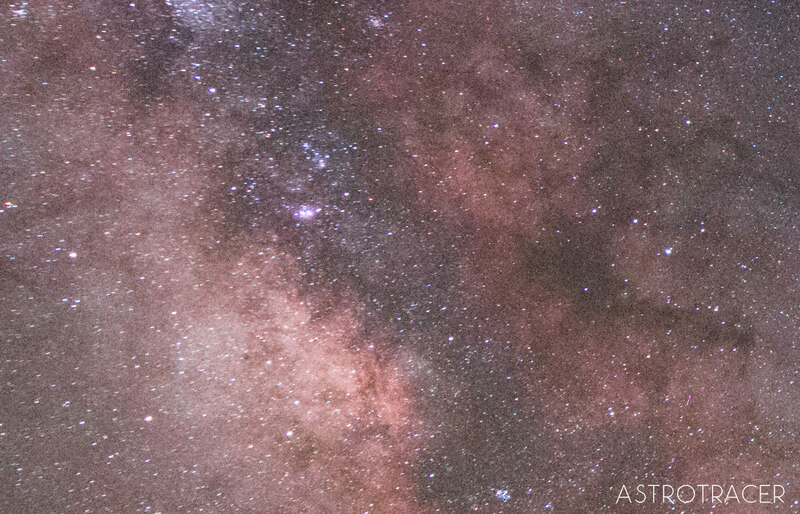 Milky Way Galactic Center, Pentax K-1 Mark II, 105mm, Astrotracer, 40s, f/5.6, ISO 6400, Stack of 2. Full resolution. 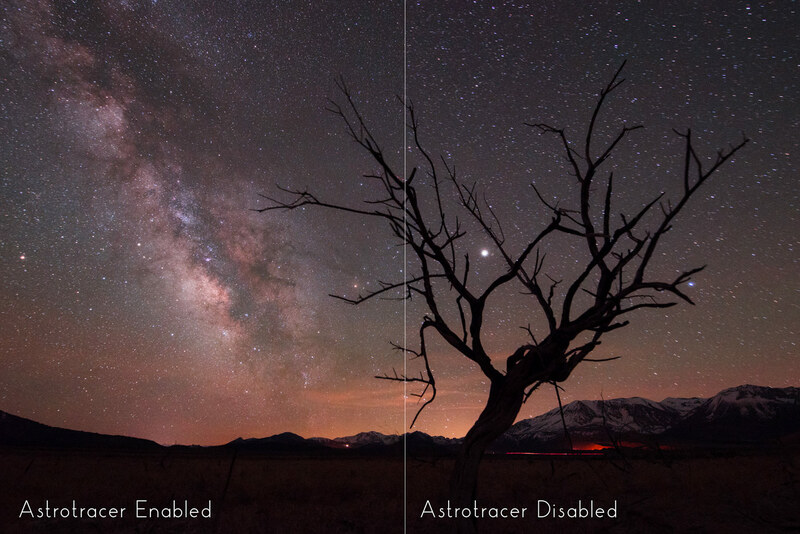 Astrotracer loses a little bit of its utility when shooting with very wide angle lenses. The rectilinear distortion of most wide angle lenses causes different parts of the image to appear move at different rates across the sensor, depending on its position, even if actually moving at the same rate in real life. Objects moving at a the edge of the frame appear to move faster than objects in the center. That means that even with the most accurate of Astrotracer shots, there will always be some star trailing in the corners of a wide angle rectilinear image. Less than a non-tracked image, but still some trailing. On a very wide angle rectilinear lens, Astrotracer tracks perfectly in the center but is doesn’t track quite as well in the corners. Overall, I’m very very happy with the performance of the Astrotracer function, even with its limitations on wide angle lenses. The results are better than untracked photos and that’s all that matters. Astrophotographers should be downright excited to be able to use this kind of feature and the K-1 Mark II (and it’s predecessor) are the only full-frame cameras with Astrotracer. One shortcoming of the K-1 Mark II in regards to Astrotracer is that the built-in time-lapse mode cannot be used on Astrotracer shots. For that, you’ll need an external interval timer. In addition to Astrotracer, the K-1 Mark II’s Pixel Shift function’s promise of improved resolution is something that I’ve wanted to utilize in my photography ever since I wrote about a similar technique for producing super resolution images. A good pixel shift image from the K-1 Mark II is often excellent and show drastically improved sharpness and micro-contrast for the finest details in an image. For landscape shooters, it’s very nice. In the comparison below, we have 100% crops of the center of the image. If you look closely, there’s much finer detail in the rocks and overall resolution is improved. Take a look at the full resolution downloads to compare more closely. Pentax K-1 Pixel Shift test frame 100 percent crop. Crop download. Full resolution RAW Download (.zip). In my experience, pixel shift works well when it does and fails completely when it doesn’t. A large determination of whether or not pixel shift is worth using is usually determined by the shooting conditions. Any movement of the camera will usually ruin a pixel shift image. It’s OK if the movement is in the frame such as a small detail like a passing bird or a swaying branch. The motion correction control in the Pixel Shift mode can compensate for and mask out these moving objects and so can post-production software like RawTherapee. But there is one case that I encountered a few times that completely negates the benefit of pixel shift: atmospheric thermal turbulence. On reasonably sunny days, temperature differentials in the air, especially those caused by the sun warming air near the ground, can create a wavy distortion effect due to thermal turbulence in the air. This phenomenon greatly affects distant fine details in an image. Thermal turbulence is a similar mechanism behind a mirage, caused by the variation in how air refracts light at any given temperature. If conditions create enough optical distortion in the air, they will negate the benefit of the K-1 Mark II’s (and any other camera’s) Pixel Shift mode. It will even limit the sharpness of non-pixel shift images. Just something to keep in mind. Movement in an image caused by atmospheric thermal turbulence will negate the benefit of Pixel Shift Resolution. That said, when the conditions were right, Pixel Shift Resolution mode made a satisfying improvement in the fine detail of an image. It’s a great feature for pixel peepers. I would like to note that the new Handheld Pixel Shift mode did not provide quite as tangible a benefit as the standard Pixel Shift mode but did improve image quality. Overall, I opted to not use the Handheld Pixel Shift mode due to its terribly slow processing time. After shooting in Handheld Pixel Shift mode, the camera is completely disabled from shooting again for around 20-30 seconds to allow for the camera to combine and process all 4 exposures. I couldn’t imagine wanting to wait this long between every shot that I avoided the mode altogether after the first few uses. If I absolutely needed to shoot handheld and wanted the benefit of Pixel Shift mode, I’d personally rather use my own super resolution method. In the few days that I used the K-1 Mark II, I was genuinely satisfied with many of the photographs that I made with the camera. Here are a few more shots made with the K-1 Mark II at Alabama Hills, California and the surrounding area. 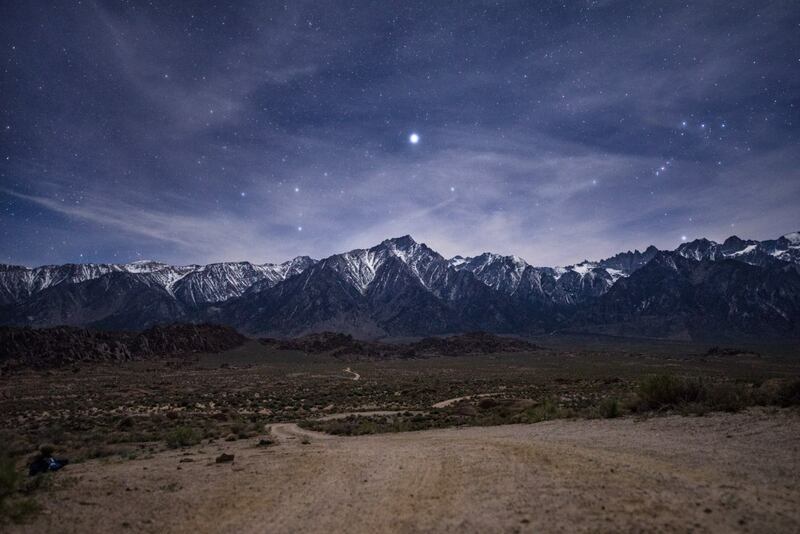 Sirius above Lone Pine Peak. Pentax K-1 Mark II, Pentax 15-30mm @ 30mm/2.8, 10s, ISO 1600. Full resolution download. Alabama Hills and Lone Pine Peak. Pentax K-1 Mark II, Pentax 15-30mm @ 30mm/8.0, 30s, ISO 3200. Full resolution download. Milky Way over Alabama Hills. Pentax K-1 Mark II, Pentax 15-30mm @ 15mm/2.8, 2*60s, ISO 1600. Astrotracer combined with non-Astrotracer. Full resolution download. Rho Ophuichi. Pentax K-1 Mark II, Pentax 28-105mm @ 105mm/5.6, 9*60s, ISO 1600. Astrotracer. Stacked. Extra noise reduction applied in post. Full resolution download. Sunrise at Alabama Hills. Pentax K-1 Mark II, Pentax 28-105mm @ 58mm/11, 1/30th, ISO 100. Pixel-Shift. Full resolution download. 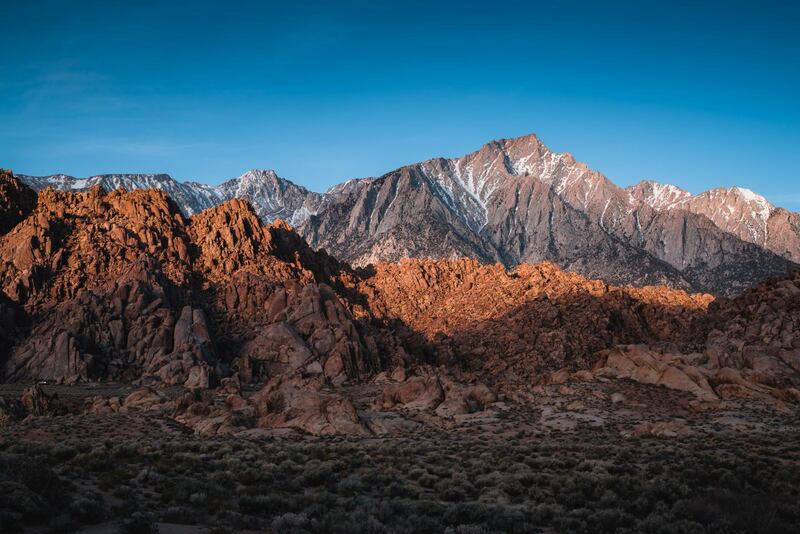 Alabama Hills. Pentax K-1 Mark II, Pentax 28-105mm @ 105mm/11, 1/25th, ISO 100. Pixel-Shift. Full resolution download. Mobius Arch. Pentax K-1 Mark II, Pentax 28-105mm @ 28mm/16, 1/60th, ISO 100. Pixel-Shift. Full resolution download. 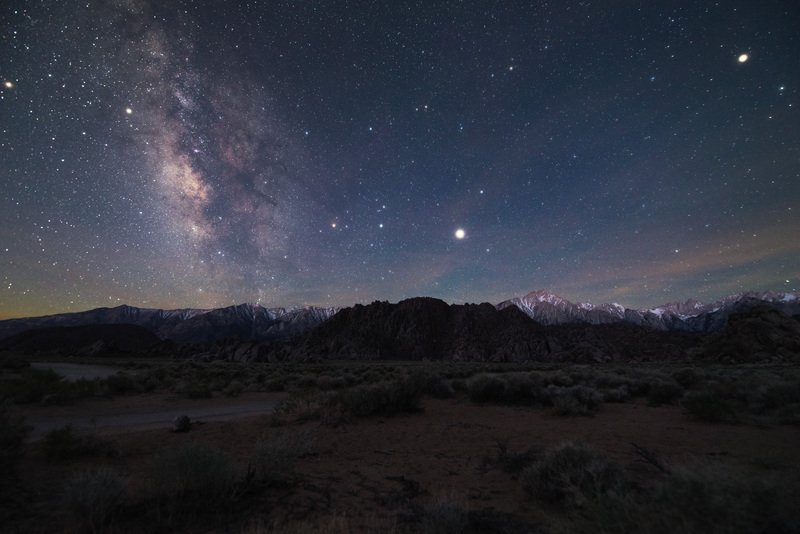 Milky Way over Alabama Hills. Pentax K-1 Mark II, Pentax 15-30mm @ 15mm/4, 2*30s, ISO 3200. Astrotracer combined with non-Astrotracer Pixel Shift. Full resolution download. Pentax K-1 Mark II is a great camera. All things considered, it’s excellent for astrophotography and I was genuinely impressed with the function of both Astrotracer (on the night sky) and Pixel Shift resolution mode (on my landscape foregrounds and daytime landscapes). Pixel Shift worked wonders on fine detail in the right conditions. 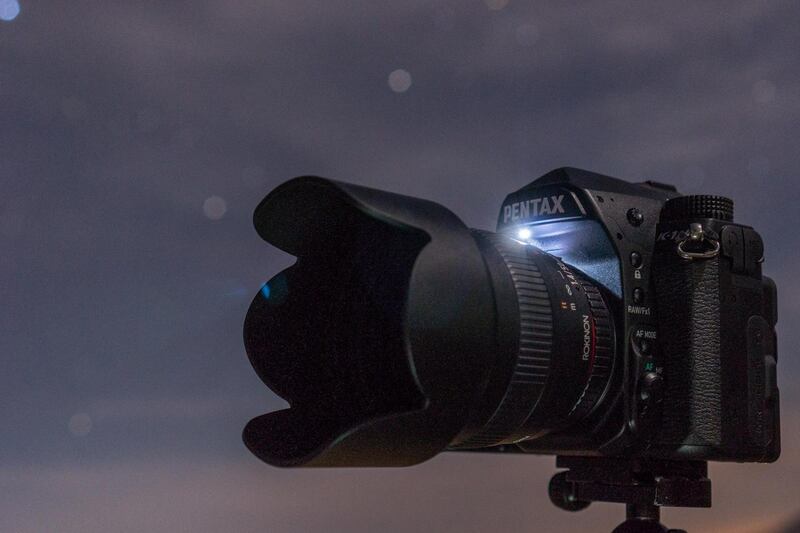 Small perks like the led illumination on the camera body, the multi-angle LCD screen, and the quick access to the most helpful controls set the Pentax K-1 Mark II apart from many other cameras and made for a uniquely friendly astrophotography shooting experience. For the price, there aren’t many cameras that offer such a wide array of unique features. I approached the K-1 Mark II with the hope that it would provide an improvement in shooting experience and image quality when compared to my current Sony Alpha mirrorless kit. It almost gets there but falls short in one key way for me personally. While it’s image quality is excellent and it’s a joy to shoot with in most cases, I personally felt the Pentax K-1 fell most short in its size and weight. It’s not just heavier than my Sony a7S, it’s heavier than almost all directly competing DSLRs. That said, don’t let my weak arms deter you. For many photographers, the size and heft of such a robustly built camera is a perk. I’m not a fan of when people use “built like a tank” to refer to camera gear, but if there was a camera that deserved the moniker, it might as well be this one. It’s just heavy like a tank, too. At ISO settings higher than ISO 400, there is noticeable “baking” of the RAW file that reduces noise but also slightly affects fine detail. We did not feel that the noise reduction compromised the results of our photos in a very tangible way but we wish the behavior did not exist. Knowing that the original K-1 shares nearly all of the same features that I love about the K-1 Mark II, but doesn’t have baked-in noise reduction, the original K-1 might be a slightly better deal than the Mark II version. We don’t feel that the small additions that the Mark II version adds such as Handheld Pixel Shift or extended ISO are significant enough to warrant an upgrade from the original K-1 to the Mark II version if that’s what you’re considering, but they’re nice-to-haves that don’t detract from the camera in any way. These affiliate links allow lonelyspeck.com to earn a small commission when you buy from B&H. 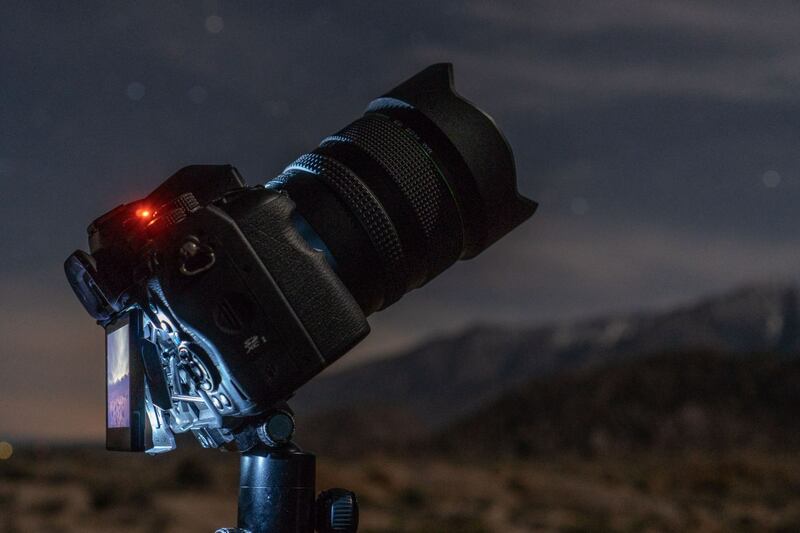 Thanks so much to Nick Smarto for helping Diana and me on this review with some night product shots of the K-I II. And thanks to B&H photo for supplying the gear on loan. Witout them, this review would not have been possible. We just wish we had more time with this beast of a camera. Whats the secret behind the “glowing” stars in your 50mm pic? Is this a photoshop action? I’m in the So Cal area and have an original K-1 that I use for night landscapes and astrophotography. I’d love to join you on a trek to a dark sky and let you fool around with the K-1 Mk 1. I’ve heard better comments about the K-1 MkI than MkII in regards to the noise reduction. Would you agree with that assessment? 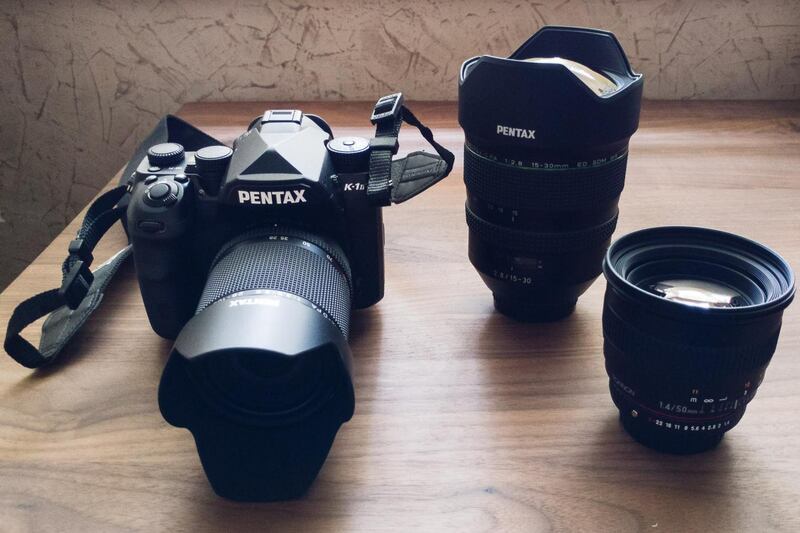 Reason being, I’m kicking around going with a Pentax K-1 for my first full-frame (excitement! anxiety!). As much as the big guys appeal (D850, A7RIII), the overall cost for those plus lenses is getting into a range that would stretch my budget more than I’d like. Pentax seems to have a nice offering at a fine price, and a fair selection of lenses at a reasonable cost. Hi Craig, thanks for the offer! Shoot me an email. Hi. Just thought I would say you you should not bend over to DPReview (Rishi). Your credibility will be forever lost as they do seem to be biased and have pre-conceptions before they even do the review. To imply a star-eater problem as in the Sony camera’s without even testing if this was true reeks of bias. Thankfully your review seems to be quite objective compared to DPReview. Hi Howard, I apologize for the hasty update, that which I have now retracted. I’ve been talking with Rishi, someone I respect greatly, with counterpoints and by sharing information from my tests. Rishi did give light to an issue that I had with the processing of my images, but as far as I can determine, the issue wasn’t, in fact, directly due to any kind of built-in processing on the part of the Pentax K-1 Mark II as we pre-emptively thought. There’s still some weirdness going on at ISOs of 800 and higher but it’s not, as far as I can conclude, tangibly detrimental to astrophotography. I don’t think anyone has claimed that the K-1 Mark II eats stars. It definitely does not. At this point, I’m still standing by my original review conclusions: The K-1 Mark II is still a camera that I would highly recommend, in addition to its predecessor, the original K-1, as of right now. I think that my images speak for themselves and at the end of the day, I downright enjoyed using the camera. I’ve never wanted to approach any camera with bias and ultimately, I’m reviewing a camera with a different scope than many others: how does it perform for astrophotography? If it’s good, then I’m happy. Other metrics like AF performance and 4K video quality, things that might ultimately change the conclusions of other reviews, need not apply in the same manner. These artifacts in stacked pictures are unfortunate, but I’m wondering whether they can be removed by dithering? Changing slightly the framing between the individual shots is a common technique in astrophotography to remove fixed-pattern artifacts as banding, hot pixels, etc… from the stacked picture. I’m just surprised that, given that you use astrotracer rather than a tracking mount, dithering is not done effectively “for free” by the drift between exposures ? PS : As far as I can see there are no fixed-patterns artifacts in the 9-frames stack @ 50mm. So it seems stacking more pictures alleviates or removes the problem (2 frames is not enough for dithering to be effective anyway). Yes, if there is either adequate time between frames, or a lot of frames, dithering can help with the artifacts. The biggest problems are apparent with smaller numbers of frames in the 1-8 range, depending on the amount of total apparent motion in the frame. Stacking of images that already line up and do not need to be re-aligned in post (e.g. foregrounds) will definitely show the problem. Thanks Ian for your answer. For those cases that may be problematic, is a simple workaround to shoot at 400 ISO and not higher, the sensor being almost ISO-invariant ? Keeping an eye on this as I do have the K-1 Mark II and Nightscapes is what I love to do the most. So very curious how this works out. Ian, if you need more images to check out, maybe I can help. If I do not already have some images that meet your needs, then I will be going to a pretty dark space in 3 weeks. Thomas, I’ve investigated further and as far as I can conclude at this time, the built-in NR on the K-1 Mark II isn’t detrimental in the way I thought with my last update. I’m sticking to my original conclusions as of right now. That said, I’d love to see your results from your shoot in a few weeks! feel free to share with me via email or on our facebook page.